Layers of Love was launched on February 24, 2010. We are nearing our three year anniversary. Layers of Love began because of a simple need, one terrible side effect of chemotherapy treatment is being susceptible to cold. In just under three years we have provided over 600 brand new fleece blankets to chemotherapy patients all over the United States and Canada. We have received donations from all over the world. We have donated blankets to Cancer infusion centers all over the United States, from Miami to New York City, from Camden, New Jersey to Milwaukee, from California to North Carolina and many more locations. We collect both adult sized blankets and pediatric sized blankets. We collect pediatric size blankets for two wonderful organizations: Chai Lifeline and The Isiah Alonso Foundation. We have also shipped blankets that have been privately requested by loved ones for their friends, family members, and work colleagues. We have received requests through our twitter account, our facebook page and through email. Layers of Love is proud to say that we have never turned down a request for a blanket. In fact, we have even been able to fulfill requests that have come in for multiple blankets to infusion centers from both nurses and patients. The reason we have been able to provide so many chemotherapy patients with comfort and warmth is because of generous people just like you. 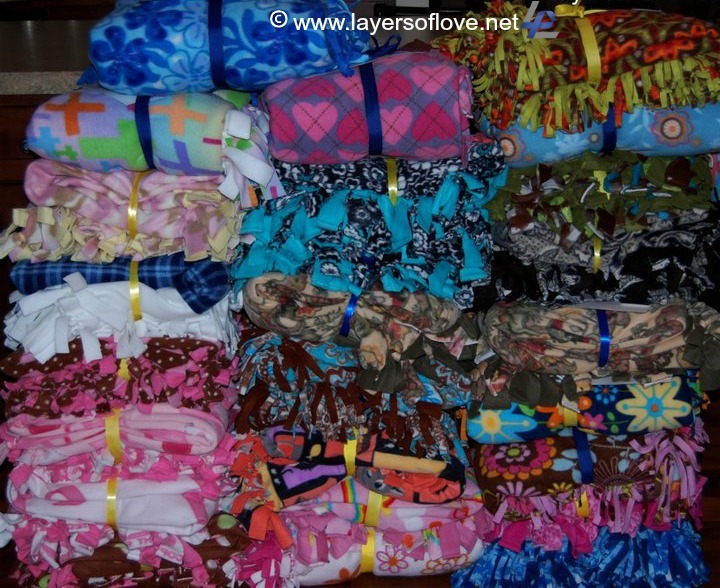 We have so many friends of Layers of Love donate blankets so that we can continue on our mission. We have had community groups, church groups, Girl Scout Troops, Brownie Troops, a Life Scout, University dorms, Summer Camp programs plus incredible individuals that have continuously donated blankets to us time and time again. We are so grateful and thank you for all the support, and blanket donations we have received over the past three years. With each day that passes by we become more and more committed to providing comfort and warmth to chemotherapy patients. We do not intend on stopping until each and every chemotherapy patient has a blanket to provide them with comfort and warmth as they go through their treatment. What three years has taught us is that not only are we warming a chemotherapy patient’s body with our blankets, we are also warming their hearts. What three years has taught us, is that when a chemotherapy patient receives a brand new fleece blanket that was donated from a complete stranger, their face lights up, their hope is raised, they don’t feel so alone, their heart is indeed warmed. We hope that as we begin on this next year of our journey that you will continue to support our mission, to help us carry on the comfort and warmth. If you would like to donate a brand new fleece blanket to Layers of Love and aren’t sure where to begin, be sure to visit our website. Check out the FAQ/Guideline tab for more information. 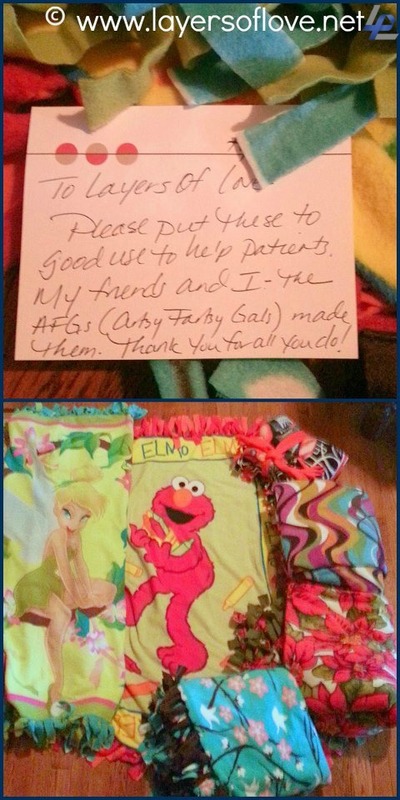 This entry was posted in Adult Cancer Patients, Cancer, Chemotherapy Patients, Donations, Pediatric Cancer Patients and tagged blanket kits, blankets, cancer, Charity, chemotherapy, collaboration, comfort, comfort and warmth, community, community groups, difference, donated, Donations, fleece blankets, giving, grateful, helping, mission, patients, pediatric, thank you, thankful. Bookmark the permalink. Congratulations! Keep up the great work! We are proud to be a sponsor.